Picadillo is chopped up goodness with peppers, onions, and in this case soyrizo– a beloved vegan product made with the same spices as chorizo, packing a bold flavor. Keep your skillet hot while you cook it to get some color, it deepens the flavors even more. Chayote is related to melons and cucumbers, and you can cut the flesh off the pit by standing it upright and cutting downwards. It’s a refreshing compliment to the smokey picadillo. Preheat the oven to 425°F. Poke a few holes in the sweet potato. Slice in half lengthwise and transfer to a baking sheet, placing cut-side down. Rub potatoes with 2 tsp olive oil and a pinch of salt and pepper. Roast until the sweet potatoes are tender, about 28 to 30 minutes. Deseed the bell pepper. Peel the onion. Small dice both. Peel and mince 3 cloves of garlic. Slice the green olives into thin rounds. Remove the soyrizo from the packaging. Place a large skillet over medium-high heat with 1 tbsp vegetable oil. Once hot, add soyrizo and cook until browned and somewhat dry, about 6 to 7 minutes. Transfer to a bowl and return skillet to heat. Add 2 tsp vegetable oil and then add the diced bell pepper, onion, and garlic. Reduce heat to medium and cook, stirring occasionally, until onion is soft and translucent, about 7 to 10 minutes. Stir the cumin, oregano, cinnamon and tomato paste into the bell pepper mixture, and then add 2 cups water. Add the soyrizo, sliced olives, and golden raisins to the skillet, bring to a boil, then reduce heat. Simmer the picadillo on low heat for 10 to 12 minutes until slightly thickened and move on to preparing the salsa. Trim the top and bottom from the chayote. To remove the skin, use a peeler to peel the squash from top to bottom. Dice squash into half inch cubes and add to a medium bowl. Add the zest and juice from the lime, 2 tsp olive oil, and a pinch of salt and pepper. Stir chayote squash salsa. Once the sweet potatoes are done, turn right side up and using a fork, mash the flesh just slightly. Season the soyrizo picadillo with salt and pepper. 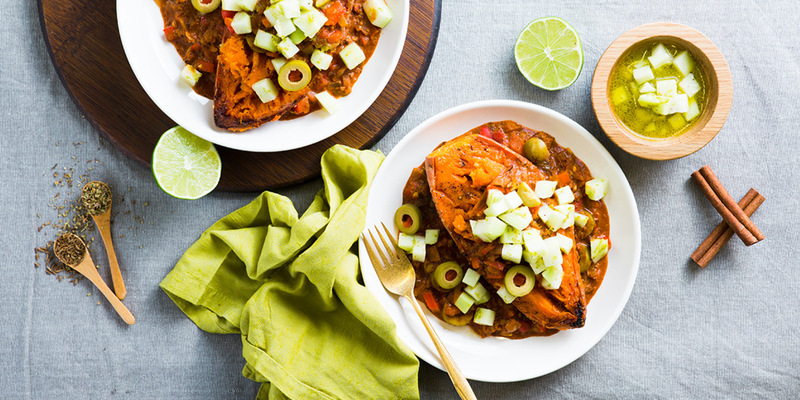 Divide the sweet potatoes between large plates and top with picadillo and chayote squash salsa. Dig in!